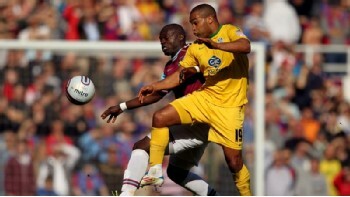 West Ham kept 11 players on the pitch for a change but could not find a way past Crystal Palace on Saturday afternoon. The promotion-chasing Hammers had goalkeeper Rob Green to thank for keeping them in the game in the first half, and then some wayward finishing cost them after the break. Green was only able to play after winning an appeal against his midweek red card, having become the third player West Ham player to be sent off in the last three matches. From those games West Ham still picked up seven points, including three on Tuesday in a stunning 4-1 win at Blackpool where midfielder Henri Lansbury deputised for Green in goal during the second half. However, they could only manage a single point with a full complement of players against London rivals Palace. The Eagles almost shocked their hosts with just 30 seconds played, Wilfried Zaha wriggling free down the right and crossing for Darren Ambrose, who curled a shot just wide. A minute later James Tomkins created West Ham's first chance with a clever through-ball but George McCartney's chip floated the wrong side of the post. Green, whose eventful week also included an England recall, was kept busy throughout the first half, blocking a fierce Chris Martin drive and tipping over the deflected follow-up from Zaha. From the resulting corner, Mile Jedinak was left unmarked right in front of goal but the midfielder headed over. Australian Jedinak kept trying his luck, though, and he forced another fine save from Green with a 20-yard shot and also fired wide in first-half stoppage time. Home boss Sam Allardyce hauled off the error-prone Julien Faubert at half-time, sending on Carlton Cole to partner Nicky Maynard in attack. The change almost paid immediate dividends when a mistake by Zaha let in Maynard who found Cole on the edge of the area, but the striker's curled shot was off target. Moments later Ricardo Vaz Te was denied by a well-timed tackle in the area from Anthony Gardner just as he was about to shoot. Tomkins then headed Mark Noble's cross over and Maynard's shot was also too high. Sam Baldock almost made himself an instant hero within seconds of coming on as a substitute after Noble put him through, but his shot was too close to Julian Speroni. Speroni denied Baldock again and Winston Reid late on, before Jack Collison blazed over in stoppage time to cap a frustrating afternoon for the Hammers. West Ham Green, O'Brien, Reid, Faye, McCartney, Noble, Tomkins, Faubert (Cole 46), Collison, Maynard (Baldock 73), Vaz Te (O'Neil 58). Subs Not Used: Lansbury, Potts. Crystal Palace Speroni, McShane, McCarthy, Gardner, Parr, Zaha, Dikgacoi, Jedinak, Ambrose (Scannell 63), Easter (Murray 74), Martin (Garvan 82). Subs Not Used: Price, O'Keefe.